This pioneering text is the only book to comprehensively explore both research and practice in the psychology of aging and to bring home the actual aging experience through the use of innovative narrative accounts. Because she limits coverage to the older years, Janet Belsky’s text is able to offer an in-depth portrait of all aspects of the field–from traditional research, to concrete applications, to the crucial issues we as a society face as our population ages. With chapters constructed to unfold like a novel, this third edition of THE PSYCHOLOGY OF AGING genuinely integrates the field, highlighting the interconnections between concepts, research, and applications. These interconnections offer students a sense of an evolving, coherent discipline. The book is carefully planned to bring home how research applies to real lives. 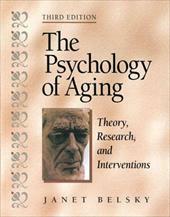 Belsky skillfully uses personal examples to highlight how concepts apply to people, and goes beyond the research to conduct her own interviews with aging professionals and older adults. Scholarly, research-oriented, and intellectually stimulating, THE PSYCHOLOGY OF AGING, offers a rare, inside glimpse into the field of aging and the aging experience as it is actually lived.